I find it interesting, but not surprising, that former Fed Chair Paul Volcker’s testimony to Congress this morning has received little to no coverage by major media outlets. Why? With few exceptions, the financial media plays along with the financial industry which pays the bills while relegating investors and the American public to the bleachers. Today, Volcker locks and loads and unleashes another volley on the wizards in Washington and their incestuous brethren on Wall Street. 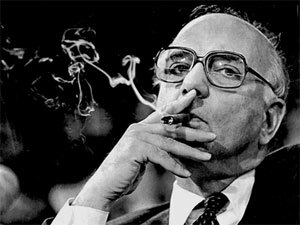 Whatever you may think of Volcker as a central banker, I hold him in high regard for elevating the debate at this critical point in our country’s economic history. Regrettably, President Obama’s adviser, Mr. Larry Summers, has taken Mr. Volcker’s chair away from the table. Yes, this is the same Mr. Summers who The New York Times described this past April as having received A Rich Education . . . Although I digress from my focus on Mr. Volcker, I find it enlightening that the man in Washington who has pushed Volcker away from the table stuffed himself at the Wall Street trough. Back to Mr. Volcker. Volcker reiterated his views today that the fundamental manner in which banks allocate capital must change in order to regain and then preserve future economic prosperity. He castigates those on Wall Street for having achieved ‘business as usual’ while he deferentially but clearly holds those in Washington in disdain for allowing it. A top White House economic adviser says the Obama administration’s proposed overhaul of financial rules preserves the policy of “too big to fail,” and could lead to future bailouts. Volcker said he does not differ with the administration on most of its proposals, and takes “as a given” that banks will be bailed out in times of crisis. But he said he opposed bailouts of insurance firms like American International Group Inc., automakers’ finance arms and others. For clarity purposes, what Volcker is driving toward is shutting down the internal ‘back room’ casinos, otherwise known as internal hedge funds, operating inside the large Wall Street banks. The capital allocated to those business units is capital that is not and will not flow through to Main Street. In short, Volcker supports backstopping commercial banking activities supporting our economy while not supporting the implicitly risky trading activities connected with banks’ proprietary business units. Will the banking system survive without these units? Yes. Will they be as profitable? No. Will their stocks be repriced without these business units? Yes. All this said, Wall Street lost trillions of dollars throughout this meltdown. A significant percentage of those losses has yet to be acknowledged. Our wizards in Washington believe that keeping the back room casino open allows the system to heal itself most quickly. Do you think for a second that as it heals itself the crowd on Wall Street will be amenable to truly changing the rules? Does Wall Street work for Washington or does that relationship truly run the other way? Volcker’s direct hit on this Washington-Wall Street charade is not only timely but critically important. Regrettably, his views will receive little attention and less chance of actually being enacted. They still deserve to be spread to the American public. I salute him for the courage of his conviction. All these are symptoms of an aging economic system. The USA now has the ultimate in ‘croney capitalism’ and sooner rather than later will be hit with some kind of pupular revolution. The public, the middle class, are being shut out of the opportunities because only a few insiders are getting all the gold. The middle class is being reduced in size daily. Working people are becoming nothing more than Serfs feeding the tax appetite of big government. Leona Helmsly said: “Oh, we don’t pay taxes. Only the poor have to pay taxes”. All too true. The voluminous tax laws are understood only by the highly paid experts that work with and for the richest. The average citizen pays an extra 20% every time he gets audited. He and his accountant can’t fight the IRS so they just have to pay even though most of the tax assessments are not even accurate. This recession should last for years and years because the average working American no longer has income adequate to buy luxury items. It is hard for Americans to make ends meet and they are buying the cheapest foods, the cheapest clothes, financing their cars, appliances, etc. The future looks very bleak while the bankers and wall street types walk away with several million dollars ( and sometimes billions of dollars) each year. I wrote a previous comment and I wanted to say one more thought: these highly paid “Wall Street types” do NOT make this big money be being smarter or better educated than the rest of us. I have a law degree from a top law school. I understand the real system as it works. The ‘insiders’ making the big money for the last 40 years are just nothing but un-regenerated crooks. They have ‘protection’ from the regulators and the US Government, (Bernie Madoff) and they take advantage of us with this protection to fleece the public. It is nothing that they do that the old ‘snake oil vendors’ did not do, only on a massively larger basis. The public has no ‘protectors’. Our elected officials are immediately in the employ of the wealthy crooks. We are in a depression, folks, no matter how much our elected officials lie about and fudge the numbers. Our financial, economic, and political system in America is broken, not going to heal itself any time soon, and when the major contributors to these elected officials remain in Wall Street offices after feeding at the trough of financial engineering for decades now, OUR POLITICAL SYSTEM IS NOT ONLY BROKEN, BUT CORRUPT TO THE CORE. Those that reaped mega-salaries and bonues during the Greenspan Put Years of ultra-cheap money to fund leveraged speculation are still creating new OTC Derivative products and paying themselves more than handsomely. MOST OF THEM SHOULD BE SERVING TIME IN DESIGNER ORANGE JUMPSUITS for breach of contract and fraud. When the bill for Trillions of Dollars comes due to ONLY THE AMERICAN TAXPAYER, there will be a revolt in this country. Times are going to get harder and harder in this Greenspan Depression and the public already knows who is principally to blame for the excesses that led to this collapse. Debt collapses take decades, not years, to correct, just ask the Japanese. The American Public is not a bunch of uneducated, docile sheep. The scroundels in Washington are going to get thrown out on their arrogant heads starting this Fall. DON’T TREAD ON ME.